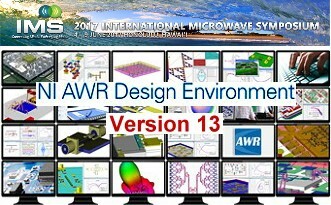 NI AWR Design Environment will be showcased in the upcoming "Advanced Load Pull for Linear Power Amplifier Design" webinar hosted by Microwave Journal on April 11, 2017. Presented by Andy Hughes, solutions architect at AWR Group, NI, this webinar will highlight recently-added capabilities within NI AWR software that deal with complex sets of load-pull data used for power amplifier design. These new features support digitally-modulated communication measurements such as adjacent channel power ratio (ACPR), error vector magnitude (EVM) and bit-error rate (BER) that can be contoured to provide further impedance optimization and insight into the impact of varying load conditions. For more information and to register for the Advanced Load Pull for Linear Power Amplifier Design webinar, visit microwavejournal.com/events/1617-advanced-load-pull-for-linear-pa-design.